The Family Owen: Harry Potter Party! 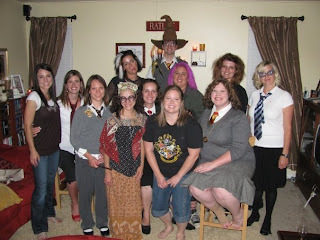 I had the most fun last night at a Harry Potter party and movie! My friend Stacey decorated her house to the nines. Her house was platform 9 3/4. We hung out in gryffindor common room, drank butter beer, ate troll eyes, bat wings, chocolate frogs, and lots more! All the horcruxes were there, and the sorting hat, and her house was a serious fire hazard with about a million candles! As you can see in the picture, we all went in costume. We had Harry, Hermione, Luna, Tonks, Bellatrix, Professor Trelawny and other cast members. It was so fun pretending we were teenagers again. After the party we went to the 12:20 am showing of the movie. I wasn't sure I would stay awake, but I did, and I totally loved the movie! Of course they left things out, they have to, but I thought it was probably the best movie yet. Loved it. Today I am paying the conequences my partying, cause I am SOOOOO tired, I didn't get home until about 3:40am. But, It was worth it. Thanks again Stacey for the good party! I'll add a link to her blog once its done, cause she'll have more fun pictures.